Illustrations: 11 b&w photos, 3 maps. From the Gold Rush to rush hour, the history of the American West is fraught with diverse, subversive, and at times downright eccentric elements. This provocative volume challenges traditional readings of western history and literature, and redraws the boundaries of the American West with absorbing essays ranging widely on topics from tourism to immigration, from environmental battles to interethnic relations, and from law to film. Taken together, the essays reassess the contributions of a diverse and multicultural America to the West, as they link western issues to global frontiers. 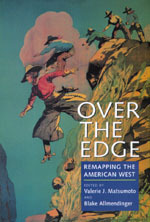 Featuring the latest work by some of the best new writers both inside and outside academia, the original essays in Over the Edge confront the traditional field of western American studies with a series of radical, speculative, and sometimes outrageous challenges. The collection reads the West through Ben-Hur and the films of Mae West; revises the western American literary canon to include the works of African American and Mexican American writers; examines the implications of miscegenation law and American Indian blood quantum requirements; and brings attention to the historical participation of Mexican and Japanese American women, Native American slaves, and Alaskan cannery workers in community life. Valerie J. Matsumoto is Associate Professor of History and Asian American Studies, University of California, Los Angeles. She is the author of Farming the Home Place: A Japanese American Community in California, 1919-1982 (1993). Blake Allmendinger is Associate Professor of English at the University of California, Los Angeles. He is the author of The Cowboy: Representations of Labor in an American Work Culture (1992).